17' 0" 18' 0" 15' 0" 1' 8"/4' 2" 24' 3"
Approx. trailering wgt. : 1,450 lbs. Unlike most of Hobie Cat's boats, the Holder 17 is neither a catamaran nor a product of the fertile mind of Hobie Alter, the multihull firm's namesake. It is instead a "monomaran" from the drawing board of businessman and designer Ron Holder. First came the cabin sloop, in 1981; the next year, a daysailer version was introduced. Best features: The Holder has good sitting headroom compared to her comps. Foam flotation is intended to make her more or less sink-proof. 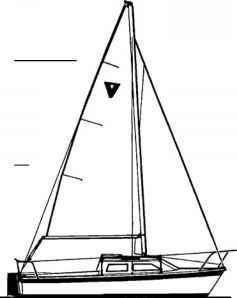 Her relatively heavy swing keel keeps her minimum draft low for easy launching and retrieval at a ramp, while offering good stability with the keel in the "down" position. With a relatively high D/L and low SA/D compared with her comps, she should be stable in heavy air. 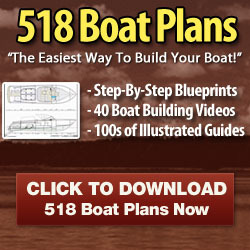 Worst features: The steel swing keel can be a pain in the neck to keep from rusting.